Tonight on Blogs and Social Networks Blog Talk Radio we discussed Virtual Worlds, not the Meez, IMVU type Virtual Worlds this time (though these sites are incredible 😉 , but the Small Worlds, Second Life, CyberTown, PlayFish, Entropia Universe, and Gaia sorts of online Virtual Reality Worlds. Sites all about your Virtual Self, not so much (or at all) about your real life self. VirtualFamilyKingdom.com Where History Comes Alive! Kongregate Choose from thousands of free flash games. Complete online game achievements to win badges. Armor Games Over 200 original Flash games, as well as a directory of other flash titles. Over 500 games to play in all. A new area just opened up under Cloud Spire! Are you brave enough to venture here? 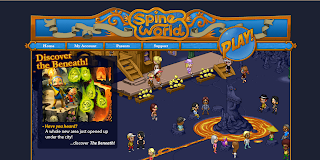 SpineWorld is geared toward the younger crowd (20 and younger) with a set up and Virtual Land that is literally Out of This World 🙂 Create an avatar, go on quests, make friends. 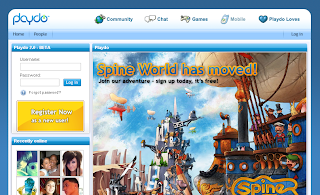 This site also has a parents area, with security features, code of conduct, and more. No download, get flown into the city while receiving your instruction and clothing.